O God, who gave the Priest Saint Jerome a living and tender love for Sacred Scripture, grant that your people may be ever more fruitfully nourished by your Word and find in it the fount of life. Through our Lord Jesus Christ, your Son, who lives and reigns with you in the unity of the Holy Spirit, one God, for ever and ever. The Literary Influence of St. Jerome | Rev. William P. H. Kitchin Ph.D.
Born in Dalmatia of a Christian, Jerome (345-420) was baptized in Rome, while taking his classical courses. He then studied under the best masters in foreign cities. But the Church had need of this extraordinarily gifted man. Jerome heard and obeyed the divine call, made a vow of celibacy, and withdrew for four years to a hermitage in the Syrian desert. 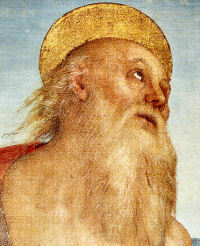 The Holy Father soon summoned Jerome to Rome and entrusted him with the enormous task of revising the Latin Bible. This work, which took 30 years to complete, is the Vulgate version of the Scriptures. He also wrote many other works, mostly commentaries on the books of the Bible. One of the greatest Biblical scholars of Christendom, Saint Jerome was born of Christian parents at Stridon in Dalmatia around the year 345. Educated at the local school, he then studied rhetoric in Rome for eight years, before returning to Aquilea to set up a community of ascetics. When that community broke up after three years Jerome went to the east. He met an old hermit named Malchus, who inspired the saint to live in a bare cell, dressed in sackcloth, studying the Scriptures. He learned Hebrew from a rabbi. Then he returned to Antioch and was reluctantly ordained priest. With his bishop he visited Constantinople and became friendly with Saints Gregory Nazianzen and Gregory of Nyssa. And then in 382 he went again to Rome, to become the personal secretary of Pope Damasus. Here he met his dearest friends, a wealthy woman called Paula, her daughter Eustochium and another wealthy woman named Marcella. Here too he began his finest work. Commissioned by the pope, he began to revise the Latin version of the psalms and the New Testament, with immense care and scholarship. Jerome eventually translated the whole of the Bible into the Latin version which is known as the Vulgate. But when Damasus died, his enemies forced the saint to leave Rome. Patron: Archeologists; archivists; Bible scholars; librarians; libraries; schoolchildren; students; translators. Symbols: Cardinal's hat; lion; aged monk in desert; aged monk with Bible. Jerome had a violent temper and was very strong-willed. He made a lot of enemies because of his temperament. To overcome these faults, he prayed and did penance. His canonization shows us that canonized saints aren't perfect, but have faults just like us. They just worked on them and cooperated with grace more fully to overcome them. What faults do we have that we need to work more diligently on overcoming? St. Jerome was a wonderful spiritual director, especially for women. It is important to have a spiritual director to grow in the spiritual life. Find out what a director can do for you, and make some arrangements for one. The Bible was of utmost importance in Jerome's life and should be in ours. Make a point to read the Bible daily. Jerome was known to say that ignorance of Scriptures is ignorance of Christ.